Cookie baker lynn: I Love Cakes and Giveaways! I Love Cakes and Giveaways! I love reading a fabulous book with engaging characters, believable settings, and engrossing story lines. Even better is finding out that the book is the first in a series, knowing there are many hours of reading pleasure ahead. That's how I felt when a friend introduced me to At Home In Mitford, by Jan Karon. The tale of a small town priest and how he got a dog, and discovered he had diabetes, and was introduced to a beautiful new neighbor, and....I know, it sounds pretty dull when I say it. But in the hands of Jan Karon, it is a page-turner. As you read, you can't wait to find out what happens next to the characters that you come to love. I was with a group of women and we were discussing what books we'd recently read. Most of them were Oprah picks, fairly gritty and grim. Then one woman mentioned the Mitford books and a wave, like a sigh of happiness went around the room. Once woman summed it up best - "Reading the Mitford books is like putting on a pair of soft, flannel pajamas and fuzzy slippers." When I was approached by the publisher, asking if I'd like to do a blog giveaway of the new paperback edition of the Mitford cookbook, I naturally jumped for joy and shouted, "Yes, yes!" That was a waste of time, since they were asking by email, but I had to do it anyway, because I was so excited. The cookbook is wonderful. Besides giving full recipes for comestibles that are mentioned in the books, there are quotes, book excerpts, charming illustrations, and kitchen tips. This must be why it's called Jan Karon's Mitford Cookbook & Kitchen Reader. You'll have plenty to read while you're roasting a chicken, baking Deep Dish Blackberry Pie, or cooling a Rhubarb Tart. Plus you can learn about how to season a cast-iron pan, how to keep strawberries fresh for ten days, and how to take starch build-up off an iron. And how can you help but love a cookbook that has four different biscuit recipes? It was easy choosing which recipe to make for this post. 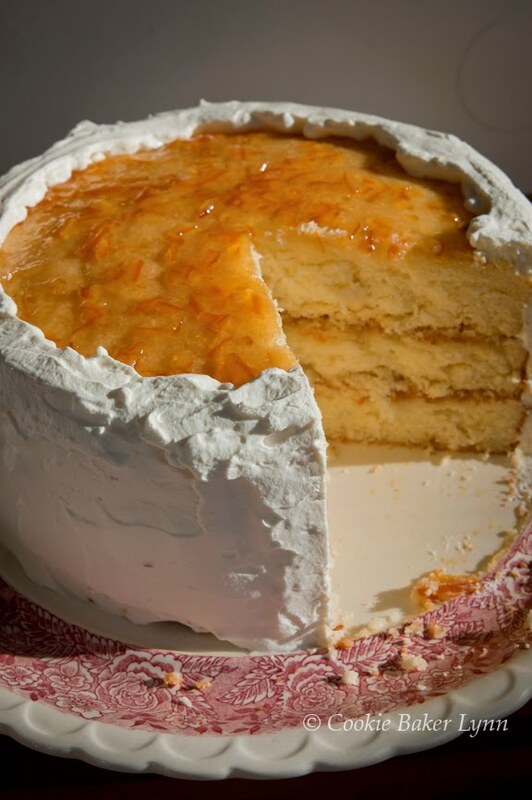 The signature dish of Esther Bolick was her Orange Marmalade Cake. It was an easy win in any baking competition, a sure fire fund-raiser at a bake sale, and the recipe was jealously guarded. In the cookbook Jan Karon reveals that at every speaking engagement, she'd get requests for the recipe. People wrote to her begging for the recipe. The problem was that there was no recipe. The cake was a work of fiction! Finally, Scott Peacock, a well-known chef, was commissioned to create a recipe in keeping with the fame of the cake. And boy, did he get it right. 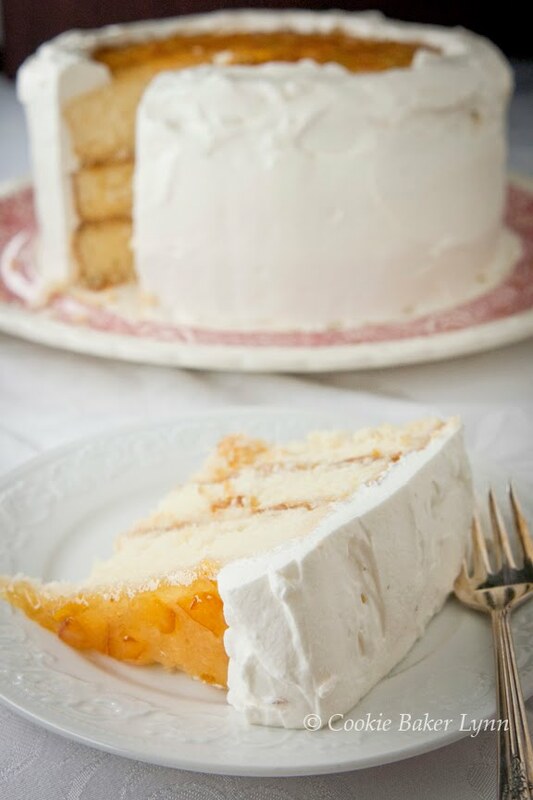 The cake is amazingly moist, flavorful, and deliciously rich without being heavy. If you make this cake, you might well become known as the premiere cake baker in your town! Perhaps because of my exuberance, the publishers sent me not just the cookbook, but also the newest hardback in the series, In the Company of Others, which takes place not in Mitford, but in Ireland. So I have not one, but two giveaways! To enter to win, leave a comment with either "cookbook" or "In The Company of Others" in your comments. You can enter for both, but they need to be separate entries. The contest is open only to the US or Canada. 1- Preheat the oven to 350 deg. F. Lightly butter three 9-inch round cake pans, line them with parchment paper, then lightly butter and flour the paper, shaking out any excess. 2- Sift the flour, baking powder, and salt into a large bowl. Sift a second time into another bowl. In the bowl of an electric mixer, beat the butter on medium speed until light in color, about 4 minutes. Add the 2-2/3 cups sugar in a steady stream with the mixer running. Beat until light and fluffy about 4 minutes. Add the eggs and yolks, one at a time, beating well after each addition. Be sure to stop at least once to scrape down the batter from the sides of the bowl. After all of the eggs have been added, continue to beat on medium speed for 2 more minutes. With the mixer on low speed, add the oil and beat for 1 minute. 3- In a small bowl combine the orange zest, vanilla, and buttermilk. Using a rubber spatula, fold in half of the dry ingredients. Scrape down the sides of the bowl and add half of the buttermilk mixture. Fold in the remaining dry ingredients, scrape down the sides, and add the remaining buttermillk. 4- Pour the batter among the prepared pans, smooth the surface, rap each pan on the counter to expel any air pockets or bubbles, then place in the oven. Bake for 30 to 35 minutes, or until a toothpick inserted into the center comes out clean. Let the cakes cool in the pans on racks for 20 minutes. 5- In a small bowl stir together the orange juice and 1/4 cup sugar until the sugar is dissolved. While the cakes are still in the cake pans, use a toothpick or skewer to poke holes at 1/2-inch intervals in the cake layers. Spoon the syrup over each layer, allowing the syrup to be completely absorbed before adding the remainder. Let the layers cool completely in the pans. 6- Heat the marmalade in a small saucepan over medium heat until just melted. Let cool for 5 minutes. 7- In a chilled mixing bowl using the wire whisk attachment, whip the heavy cream with the 4 Tbsp sugar until stiff peaks form. Add the sour cream, a little at a time, and whisk until the mixture is a spreadable consistency. 8- Invert one of the cake layers on a cake plate and carefully peel off the parchment. Spread one--third of the marmalade over the top, smoothing it into an even layer. Invert the second layer on top of the first, peel off the parchment, and spoon another third of the marmalade on top. 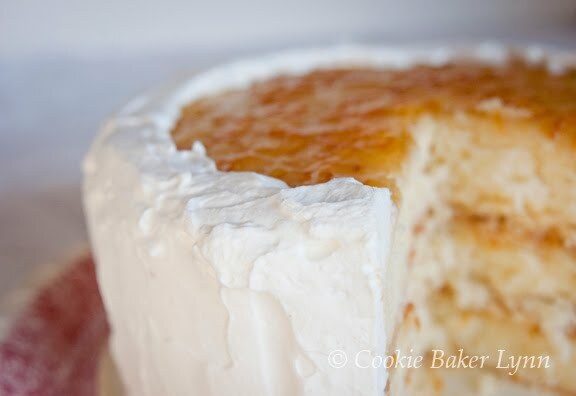 Place the third cake layer on top, remove the parchment, and spoon the remaining marmalade onto the center of it, leaving a 1-1/4 inch border around the edges. Frost the sides and the top border with the frosting, leaving the marmalade on top of the cake exposed. 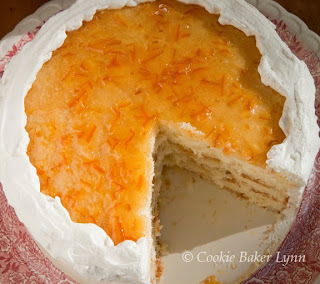 Or, if your prefer, frost the entire cake first, adding the marmalade as a garnish on top. Chill for at least 2 hours before serving. That cookbook looks amazing. I'd love to win it! I love Karon's books. I'd love to read "In The Company of Others". I love them so much that I feel like its my guilty pleasure! They are always so heart warming. I've read the Mitford series twice and would have to agree with the feelings of warmth & coziness it evokes! I would absolutely love to have the cookbook... my sister, my mom & I have all talked about that orange marmalade cake many times - how fun to have the recipe! I haven't heard of "In the Company of Others", but I would love to read it! Hey...so I am chopped liver? The cookbook sounds wonderful! I love that it has more than just recipes...pictures, tips, book excerpts, etc! Cookbook! That cake looks amazing. Cookbook! I wish I had a slice of that cake in my belly right now! I love cookbooks and would so enjoy a new one! I've never heard of In the Company of Others but I am totally intrigued by the sound of this series! This cake has me dreaming! Enter me please. I'd love to win the cookbook! Thanks for the opportunity! Count me in for the cookbook! i have never heard of this author and i'm always interested in good recommendations - especially for series. thanks. would love to win the cookbook - sounds like it would be interesting to both cook from and read. I've tasted that cake in my mind many times. :) It looks as good as I've imagined, too. I'd love a copy of the cookbook. Thanks! Wow, that looks so good! I'd love to try out this cookbook! I am tasting this cake even as I write this, and it is light, moist, sweet, and luscious.....just as I always imagined when Father Tim overdid. Don't blame him a bit. How fun it would be to win that cookbook! So delighted that Jan Karon has begun this new series with my favorite Episcopal priest and his practical, yet artistic wife. Would love to read "In the Company of Others"--what a treat it would be to win it! Thank you for the opportunity. Ceratinly The Cookbook. This cake looks Awesome! Oooh! I would love to win that cookbook. I love cooking/baking and I love reading. I would love to read "In the Company of Others". I've never read any of Jan Karon's books, but they sound great. pick me for the cookbook!!! The cake's frosting has sour cream in it. How can I not enter the Cookbook giveaway? I love the height of your cake and the color of the marmalade against the white frosting is beautiful. Thanks for doing the giveaway. I would LOVE to win the cookbook! I think I'd use alot of the recipes~! Some of my favorite cookbooks are those that include stories to go along with the recipes. I'm currently reading 'Christmas Memories with Recipes' and now I can't wait to get my hands on this cookbook! Cookbook! What a great giveaway! Though I've never read the series, I'll be checking it out at the library. I like Karon's books too, Lynn. And this cake? Absolutely divine!! I listened to one of the Mitford books on CD. It gave the Orange Marmalade Cake recipe at the end, and I was having to stop and start and stop and start until I could get it all written down! Having it in a cookbook would be so much easier!!! I'd love the chance to win a cookbook. I'd love the chance to enter to win "In the Company of Others". Oh goodness!!! My mom has the cookbook and I've made Puny's banana bread, which is very good. 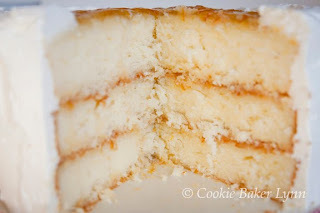 Don't think I've ventured up the courage to try the orange marmalade cake yet, but it looks just delicious! I'd like to have a chance at "In the Company of Others." I'm late to this party, but I'm okay with that because I already love Mitford! I live about 45 minutes away from "Mitford", or Blowing Rock. And it's one of my favorite places in this great state! Beautiful cake. In The Company of Others sounds like a wonderful book. I love anything set in Ireland!! I haven't heard of/read any of those books, but that cake looks awesome! Yum! I haven't heard of those books before but now I want to read them! And I love the sound of this cake. The whipped cream sour cream frosting sounds so good and I love the marmalade on top.